Did you Google her name or pictures on the web ? Just like Xerox means Photocopying and FedEx refers to shipping something, the term Google has become synonymous to searching for information on the web. Now even the widely respected Oxford English Dictionary have also put their stamp of approval on the tremendous popularity of the term Google. Google [a trademark] has been officially included as a verb in the Oxford Dictionary of English during their recent quarterly update. Google hates when people use their company name as a verb, they even sent a Cease & Dessist notice to WordSpy for promoting the term Google as a verb. I am waiting to see how the Googleplex residents react to this inclusion by the Oxford. 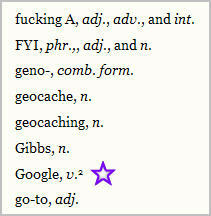 On the funny side, Google is added to the dictionary along with the F word. Look the screenshot above.